The ideal support strategy for a mechatronic system in need of repair is one that administers the support as required in situ without the need for human decision or intervention. This is very much the process by which humans themselves have great resilience in that the micro repair of damage, the process of healing, goes on without intervention unless the damage sustained is severe. Large engineering systems in safety critical situations already have a level of self-diagnosis (built in self test) and self-fix, if not self-immobilisation to prevent more serious damage. However, the migration of self-repair to lower value systems is a process which engineering is just beginning. Examples of existing self-repair at the smaller scale (such as self sharpening knives and self repairing bearings from the mechanical world, self repairing paint from the materials world and self fixing memory from the electronics world) are with us already across many areas of interdisciplinary engineering. In all these applications, there are generic concepts at work in the healing paradigm: self-diagnosis, with redundancy of resources and timescales to affect the repair. This project aims to devise architectures that exploit self healing technologies for electronic and mechanical components and subsystems to reduce maintenance. Progenitors to the self-repair capability can be found in domain-specific research such as materials, mechanics and electronics. Self-sharpening knives and self-repairing bearings from the mechanical world, selfrepairing paint from the materials world, and self-fixing memory from the electronics world are with us already. This research will first develop the self-healing approaches within the electronic and mechanical domains separately and then study the coupling of these domains. This differs from the research of our main competitors in the project area who are mainly focused on developing domain-specific concepts. Is it possible to simulate the coupling between mechanical and electronic sub-systems such that self-healing strategies can be quantified and evaluated? Can we learn from biological self-repair strategies such as stem cell therapy and how best to implement mechatronic self-healing? How can evolutionary multi-objective optimisation techniques be used to support design for self-healing using basic building blocks? Are there common methodologies found in existing self-healing systems to enable future designs? 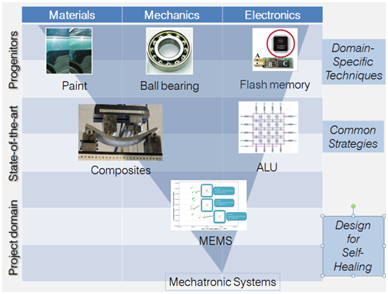 What are the best case studies from the domain of Micro-Electro-Mechanical-Systems (MEMS) to exemplify self-healing?